One day after the press conference at the Centre Baba Moustapha, the End Conference of Connecting in Times of Duress officially kicked off. The opening ceremony was attended by a rich audience of researchers and artists, as well as representatives of the institutions: the representative of the University of N’djamena, the representative of the IRED (Institute Recherche en Elevage pour le Developpement), the dean of the Faculty of Humanities and Social Sciences, the chief of the Department of Economics and Management. Djimet Seli, chief of the Anthropology Department of CRASH, welcomed the participants highlighting the international character that marks the conference, for which researchers and artists travelled to the Chadian capital. The general secretary of CRASH Prof. Khalil Alio spoke first, thanking the partners and the institutions who supported the project and praising the role of CRASH as a frontline actor in academic research in Chad. After Prof. Khalil Alio, the coordinator of the CTD programme Prof. Mirjam de Bruijn took the floor presenting the project that in the last 5 years engaged a team of 15 researchers working on the question: how does the introduction of ICTs changes patterns of communication and information flows where people live in duress? 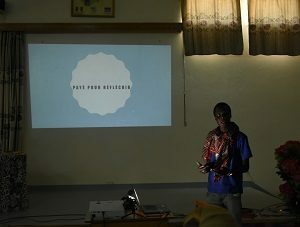 As she was speaking, a slideshow of pictures was projected in the background, showing images from the different researchers’ fieldworks. This series of landscapes, portraits, people, everyday life scenes was used by Prof. De Bruijn to introduce a reflection on the role of technologies as a crucial element in shaping the methodology and the content of CTD programme, and even to influence the possibility of research to be carried on and shared inside and outside of academia. The dissemination of knowledge emerges as a main point in Prof. De Bruijn’s speech, and the connection of the CTD end conference to the festival N’djam s’enflamme en slam goes in that direction. “L’academie dans la rue” (“academia in the street”), is a formula she uses to express the desire of disseminating knowledge by deconstructing the boundaries between academia and art. Co-creation emerges then as an essential way to do research: “dans la recherche c’est pas sol le chercheur qui dirige. Le chercheur ne peut rien faire sans les autres”. 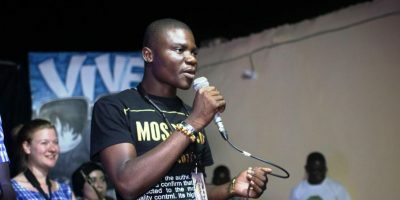 The “academia in the streets” was very present in the words of Didier Lalaye, artistic director of the festival N’djam s’enflamme en slam. Being both a well-known slam artist and a PhD candidate, shared with the audience a vivid first-person reflection on this double positioning in and outside of academia, and on the balance between art and scientific research, from the point of view of a “schizophrenic researcher”, as he called himself. Which kind of knowledge can we create when, as researchers, we are paid for reflecting, while art is a never-ending and priceless process? And then: how, where, and for which kind of reward do we express our intellectual research? The Diploma or the CD? The office or the stage? Le salaire (the salary) or le cachet (the fee)? Reflecting on these questions that mark his life as chercheur schizofrene, Didier Lalaye showed that being an artist can be a universal way of doing research. The ceremony was closed by the cultural promoter Bani Ngata Ngoulou, who praised the event as an initiative that, bringing to Chad people from such a diverse range of background and different countries, works as an inspiration for the Chadian youth to grow and develop itself. Finally, Meriém, slam artist from Algeria, closed the event with a slam performance both in French and Arabic. 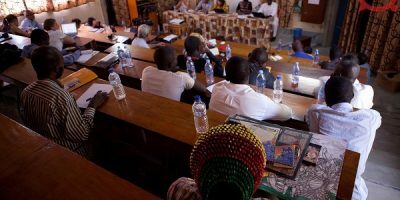 The event was followed by an introduction to the theme of the CTD project by Prof. Mirjam de Bruijn, and the contribution of the keynote speaker Saïbou Issa.